Truckee junior Montana Montgomery crosses the finish line in first place in the Class 3A regional championships on Friday, Oct. 26. 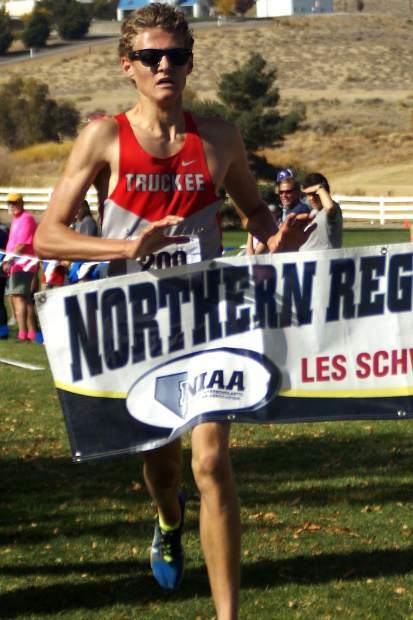 After finishing as a runner-up at last year’s Class 3A Northern League championship, Truckee junior Montana Montgomery took his place as the league’s top distance runner, capturing a first-place finish last week at the cross-country regional championship race. Montgomery outpaced the Northern League’s top runners by 17 seconds, finishing the 5,000-meter course at Rancho San Rafael Regional Park in Reno with a time of 17 minutes, 3 seconds. The win marked Montgomery’s second of the season, and first regional championship of his career. Truckee senior Calin Laine had a strong showing as well, finishing the race with a time of 17:34 for fourth place. Junior Benjamin Breuch (19:13), senior Ids Propstra (19:15), and senior KC Larkins (19:32) were the boys other scoring runners. As a team, the boys qualified for state with a third-place finish, tallying 69 points on the day. Elko won the meet with a score of 52, followed by Spring Creek with 59 points. On the girls’ side, Truckee junior Isabella Terrazas led the team with a fifth-place finish, crossing the line with a time of 21:01. Sophomore Hana Mazur was ninth with a time of 21:29, followed by freshman Petra Kidd (21:33), sophomore Amelia Swanson (21:52), and freshman Sonny Strusinski (22:32). As a team, the Lady Wolverines finished in second with 51 points. Defending state champions Spring Creek won the regional title with a score of 25 points. Elko also qualified its team to state with 97 points. The Class 3A state championship meet will be held Saturday at Veterans Memorial Park in Boulder City, outside of Las Vegas.